Paronychia is an infection of the skin around fingernails and toenails. Bacteria or a type of yeast called Candida typically cause this infection. Bacteria and yeast can even combine in one infection. 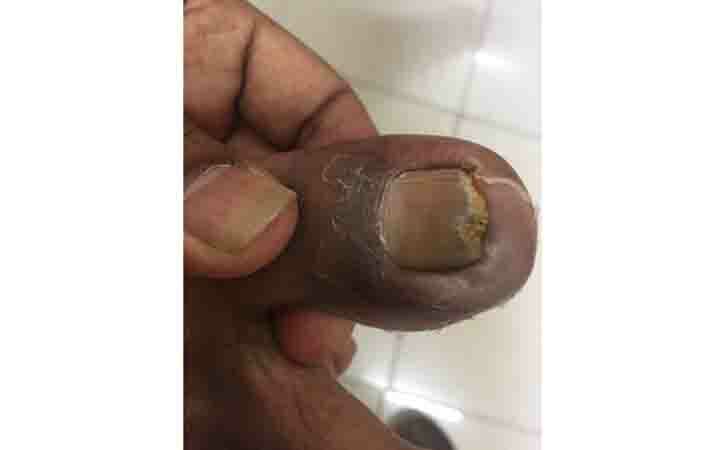 Depending on the cause of the infection, paronychia may come on slowly and last for weeks or show up suddenly and last for only one or two days. The symptoms of paronychia are easy to spot and can usually be easily and successfully treated with little or no damage to skin and nails. Infection can become severe and even result in a partial or complete loss of nail if it’s not treated. 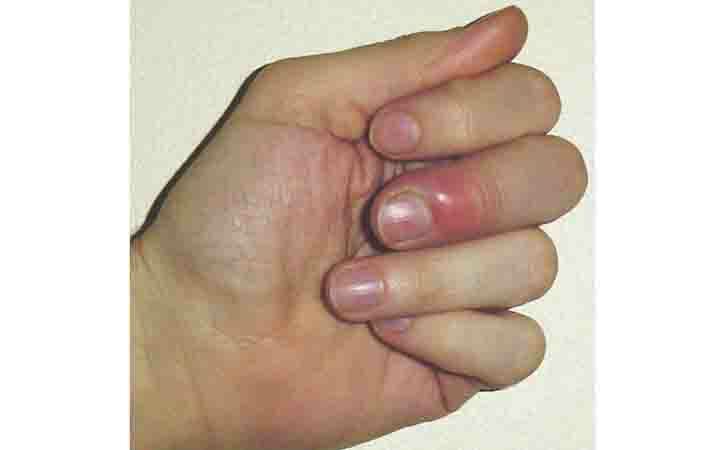 Paronychia can be either acute or chronic depending on the speed of onset, the duration, and the infecting agents. Paronychia can happen to adults and children. Usually it isn’t serious and can be treated at home. An acute infection almost always occurs around the fingernails and develops quickly. It’s usually the result of damage to the skin around the nails from biting, picking, hangnails, manicures, or other physical trauma. Staphylococcus and Enterococcus bacteria are common infecting agents in the case of acute paronychia. Chronic paronychia can occur on your fingers or toes, and it comes on slowly. It lasts for several weeks and often comes back. It’s typically caused by more than one infecting agent, often Candida yeast and bacteria. It’s more common in people who’re constantly working in water. Chronically wet skin and excessive soaking disrupts the natural barrier of the cuticle. This allows yeast and bacteria to grow and get underneath the skin to create an infection. Typically, paronychia begins with pain, swelling and redness around the base or the sides of the nail. The symptoms of both acute and chronic paronychia are very similar. They’re largely distinguished from each other by the speed of onset and the duration of the infection. Acute infections develop quickly and don’t last long. Acute paronychia can cause pus-filled pockets (abscesses) to form. Chronic infections come on slowly and last for many weeks. It may cause the cuticle to break down. This type of paronychia may eventually cause the nail to separate from the skin. The nail may become thick, hard, and deformed. Paronychia caused by bacteria can get worse quickly. Fungus-caused paronychia typically gets worse slowly over time. There are multiple causes of both acute and chronic paronychia. The underlying cause of each is bacteria, fungal (Candida yeast), or a combination of the two agents. A bacterial agent that’s introduced to the area around nail by some type of trauma typically causes an acute infection. This can be from biting or picking at nails or hangnails, being punctured by manicurist tools, pushing down cuticles too aggressively, and other similar types of injuries. The underlying agent of infection in chronic paronychia is most commonly fungal (Candida yeast), but it can also be bacteria. Because fungal (Candida yeast) grow well in moist environments, this infection is often caused by having feet or hands in water too much of the time. Chronic inflammation also plays a role. Paronychia is more common in adult women and in people who have diabetes. People who have weak immune systems are also at higher risk of getting paronychia. This includes people who must take medicine after having an organ transplant or people who are infected with HIV. Treatment for paronychia depends on how severe the infection is. Home treatments are often very successful in treating mild cases. If have a collection of pus under the skin, can soak the infected area in warm water several times per day and dry it thoroughly afterward. The soaking will encourage the area to drain on its own. Doctor may prescribe an antibiotic if the infection is more severe or if it isn’t responding to home treatments. May also need to have blisters or abscesses drained of fluids to relieve discomfort and speed healing. This should be done by doctor in order to avoid spreading the infection. When draining it, doctor can also take a sample of pus from the wound to determine what is causing the infection and how best to treat it. Soak the affected foot or hand 3 to 4 times daily for 20 minutes in warm water. Can add hydrogen peroxide half of the solution. Apply an antibiotic ointment and bandage. An oral antibiotic will likely be prescribed. If have diabetes, there is a risk that paronychia could spread to deeper tissues and bones, or into the bloodstream and other parts of the body. In extreme cases of deep infection, paronychia can result in the loss of fingers, toes, or limbs. The best away to avoid acute paronychia is to take good care of nails. Avoid injuring nails and fingertips. Don’t bite or pick nails. Keep nails trimmed and smooth. Avoid cutting nails too short. Don’t scrape or trim cuticles, as this can injure the skin. Use clean nail clippers or scissors.